History is full of unsolved deaths that continue to baffle contemporary mystery enthusiasts. Forensic science has rapidly progressed since the beginning of the 20th century, and many of the historical crime mysteries would likely have been solved if they would have happened in more recent times. However, evidence lockers across the world still contain numerous items related to strange and inexplicable cases that will probably never be solved, either because forensics failed to treat them with enough scrutiny when they occurred or because they were simply too bizarre to be understood. One such case from Brazil, popularly known as the “Lead Masks Case,” has been haunting the minds of many investigators for decades. On August 20, 1966, a youngster was exploring the slopes of Vintém Hill in the municipality of Niterói near Rio de Janeiro. He was traversing the rough terrain of the hill in the hope of finding a perfect spot to fly his kite, but instead discovered a frightening scene: two dead men, dressed in formal suits and rainproof overcoats lying next to each other on a small grassy knoll far up the hill. The eyes of both men were covered by peculiar eye masks made of thick lead. Due to the rough terrain of the hill, the police couldn’t reach the spot where the men were found until the next day. When they finally got to them and began examining the scene, investigators realized that the men’s attire and the lead eye masks weren’t the only peculiar things that surrounded the case. Namely, a note was found in the pocket of one of the men and it contained only the following information, “16:30 be at the specified location. 18:30 ingest capsules, after the effect protect metals await signal mask.” Also, an empty water bottle and two wet towels were found next to the bodies. An investigation revealed that the men were electronic technicians, named Manoel Pereira da Cruz and Miguel José Viana, from the nearby town of Campos dos Goytacazes. They left their hometown on August 17th, three days before their bodies were found, with the alleged intent of purchasing work-related materials in the town of Niterói. A local waitress remembered them entering the bar where she worked and buying a bottle of water. She stated that one of the men looked extremely anxious and kept checking his watch all the time. Since the bodies of the men were exposed to the elements for more than three days, their outward appearance couldn’t reveal the cause of death. However, the coroner concluded that their remains displayed no signs of violence. Curiously, the police never performed a toxicological analysis of the men’s bodies, so it will never be known whether they actually ingested any strange capsules that were mentioned in the cryptic note. In the following weeks, several investigators noted that the strange eye masks, overcoats, and wet towels were probably supposed to serve as protection from radiation. The bodies of the men were then scanned for radiation but the scans revealed levels of radiation that were not even slightly above normal. Although many theories on the Lead Masks Case have surfaced over the years, it is safe to assume that no one will ever know what actually happened to the men. 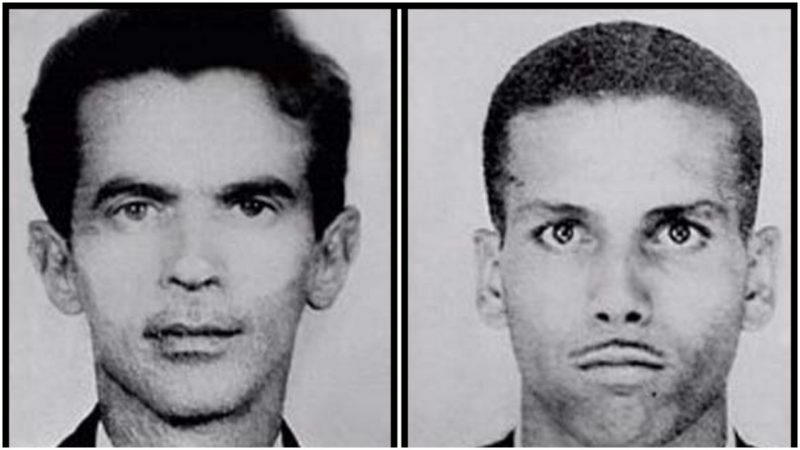 Some contemporary researchers theorize that the men were illegally selling radioactive materials to unknown buyers from the Brazilian criminal underground. According to this theory, the men were killed by the buyers and transported to the hill in order to confuse the police. Still, this doesn’t explain the strange capsules which were supposed to be ingested by the two dead men. Another theory, one put forward by conspiracy theorists, states that the men ventured to the secluded location on the hill because they were following instructions dictated by extraterrestrial beings. UFO enthusiasts who support this theory state that the men were likely instructed to protect themselves from radiation emitted by a descending UFO by ingesting special capsules and wearing lead eye masks at the moment when the spacecraft was about to land near them. However, the most plausible theory was put forward by a friend of one of the deceased men. Several months after the bodies were found, the friend revealed that the two men were members of a secret religious cult of “scientific spiritualists” which was heavily involved in experimentation with psychedelic drugs. In order to perform some weird religious ritual, the men were allegedly supposed to ingest capsules containing an unknown hallucinogenic substance and wait for extraterrestrials to contact them. Since the weird event occurred in the mid-1960’s, at a time when recreational use of psychedelic drugs was at its peak, it is completely possible that the men took extremely high doses of some hallucinogen which caused them to embark on an unfortunate psychedelic trip which ended in their death in the rough terrain of Vintém Hill.